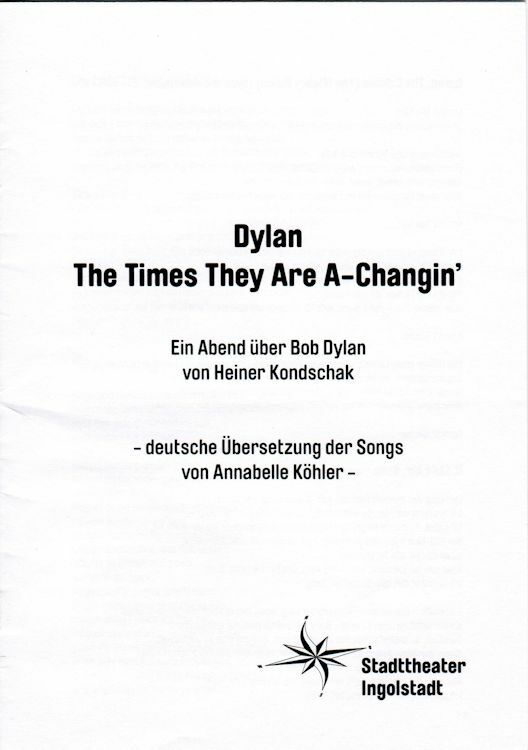 DYLAN -THE TIMES THEY ARE A-CHANGIN' (Germany). Play by Heiner Kondschak based on the life of Bob Dylan, performing rights by Harlekin Theater und Verlag, T�bingen. 2012, Stadttheater Ingolstadt. Supplement with song-lyrics in German. A5-size. 16 pages. Both items were given at the play when you bought the tickets. 2014 July 15-20, flyer for the play, Munich, Deutsche Theater.